Hello, I've got a little question for you guys. Is there any other reasonable solution for extending cranes with three sections (or more) than the cable solution in 8421? And how do they do it in real life? if jou have the super long Crossaxles from the construction site set is it possible. on old real cranes its working often with ropes. modern Cranes works with a single cylinder who push the first stage out and locking the first stage with the main boom. then will the cylinder locked on the next stage, unlocked on the main boom and the pistonrod will pulled in. is this complete the cylinder will locked on the first stage and the second stage could pushed out. you can have more than three sections quite easily all you need is two pieces of Lego string the same length one for extending and one for retracting you should be able to pull on each one to get it retracted or extended. The trick is to make each section as thin and small as possible so you can fit lots of smaller sections inside each other. 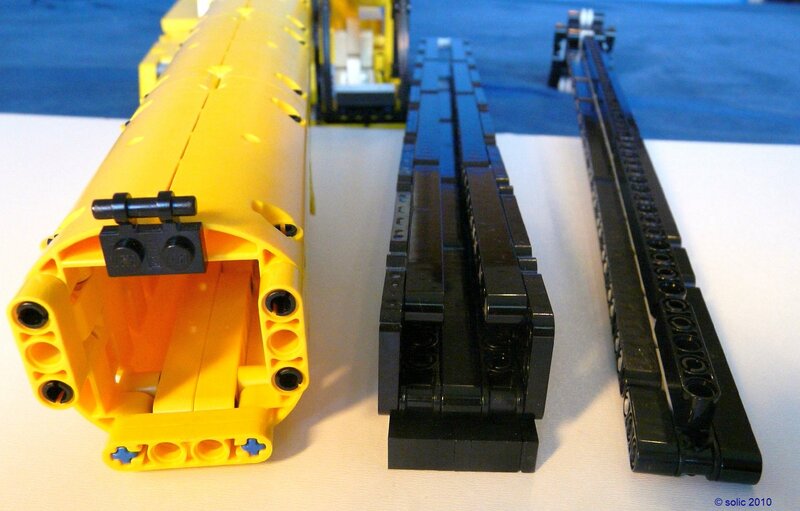 "Creating a three section telescopic crane boom from Technic Lego is something that occurs to many people, however, actually making one is far from straightforward. Part of the attraction of building this mechanism is that all the official Lego crane models only have two section booms. While it is certainly possible to achieve this with a rack and pinion on each moving section, this entails having a motor on both the bottom boom and the middle boom - not an ideal solution. "How real telescopic cranes achieved this was a mystery to me until recently, when I came across a picture showing the workings of a boom in this Acrobat document from the Liebherr web site. Basically, only the second section is moved by a hydraulic ram attached to the first section, with all the other sections being moved simultaneously by a complex system of pulleys. It is actually very simple when you think about it, but to come up with this idea in the first place must have required sheer genius. Here is a diagram showing how it works, in the simpler case of a three section boom; it is possible to totally conceal the pulley system within the booms, but showing it this way facilitates understanding. "The red line denotes the cable, red crosses show where it is attached to the boom, and the red circles represent pulleys. It can be seen from this diagram that holding one section still and moving any other section relative to it will produce an equivalent movement in the remaining section. So, to move the third section in sync with the second, all you need to do is move the second section relative to the first and it will happen automatically." 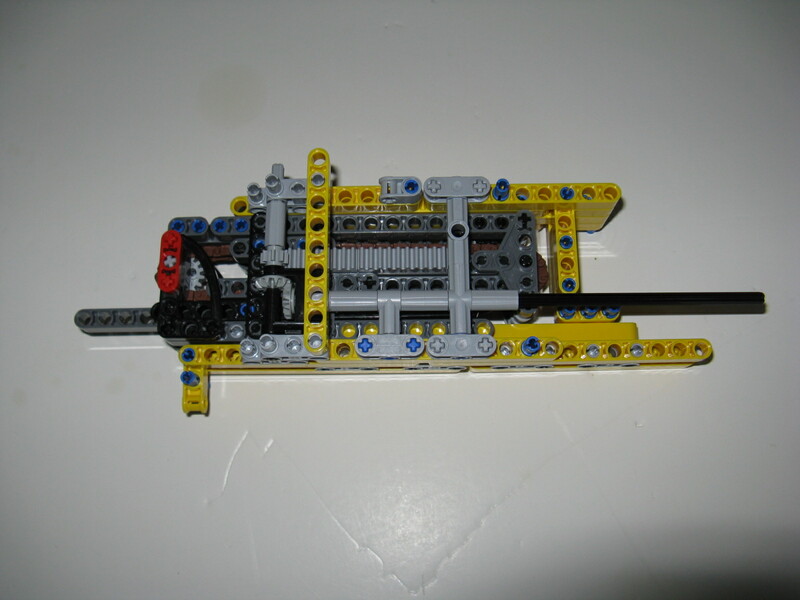 "My Lego implementation uses a rack and pinion system powered by a single motor to move the second section relative to the first. What may not always be obvious at first glance is that the pulley system will actively move the third section when the boom is telescoping both upwards and downwards - gravity is not required to retract the boom." I was bored one evening this week and also wondered if there was an another way to build a multi-section boom. Having seen solic's nice conventional crane with extendable boom, it gave me a "push" to find an alternative solution. Finally I resorted to lego chain links, and IMO the result is not that bad. Hi guys! First time on EB. 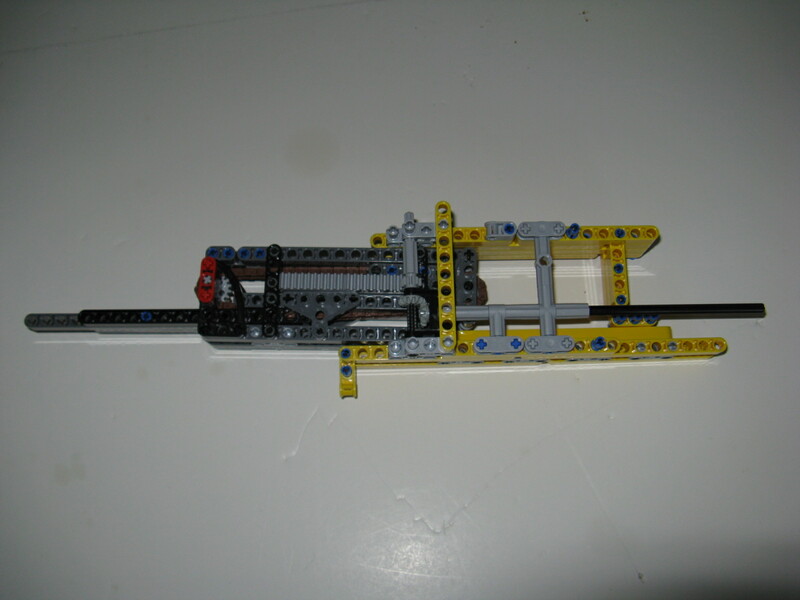 I was wondering if there is any way of emailing SOLIC from brickset about his 3 section boom? I was going to make an exact but I was wondering if he has a parts list? Any help would be appreciated! I have invited solic to read this topic. Hello to all, it is my first post on EB. In my boom I’ve used string mechanism to extend 3rd section of boom – same as Jennifer Clark's and used in 8421 crane, mainly because of lack of space inside boom for any other more sophisticated solutions. And it is just simple and good working mechanism. Sorry, I do not have any part list for this boom. Generally you can see from the photos what type of parts are and estimate the quantities required.